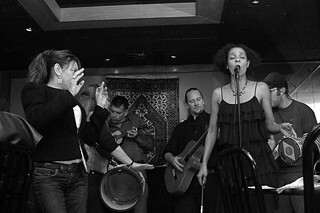 A side project of Pagee Go Go (www.pageegogo.com), Jeff Alexander on guitar and Ana Paula Vanancio on vocals played Brazilian pagode ("pah-go-gee") music at the Mediterranean Hookah Lounge on Friday night. Other members of Pagee Go Go and friends sat in on some tunes, fleshing out the deliberately sparce renditions of classic folk tunes. Despite the lack of any real dance space, the patrons found they could squeeze some samba in between tables.